At Innovize, we look beyond the core production specifications to help you with other business issues surrounding product manufacturing. Whether it’s operational efficiencies, special services or market-oriented special projects, we’re here to help make your business better. We want you to challenge us. And we want to develop the kind of partnership that produces these custom solutions. We call these “Customizations”; we measure them and hold our associates responsible for uncovering opportunities and adding value through these custom business solutions. Call Innovize at 1-877-605-6580 or use our contact form. 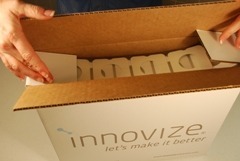 Instead of furnishing this product on a roll, Innovize “Fan Folds” it and prepares it for splicing. Our box becomes a “cartage” for our customer’s automated equipment (eliminating roll change time for this component part) and increasing their daily output. Custom solutions like this are the result of our desire to understand your business and work with you to provide more value in our partnership.